Most of the year, I really enjoy living in Phoenix. It’s a beautifully different city with its unique landscape and recreational opportunities. But if you ask me in July – or August, September, or the first half of October – I’ll tell you I’d move tomorrow if it weren’t so hot! Yes, I knew what I was getting into when I moved here, but I don’t think you can call yourself a true Phoenician unless you gripe and complain about the heat fairly regularly (smile). Needless to say, 110+ makes any sort of water incredibly appealing! 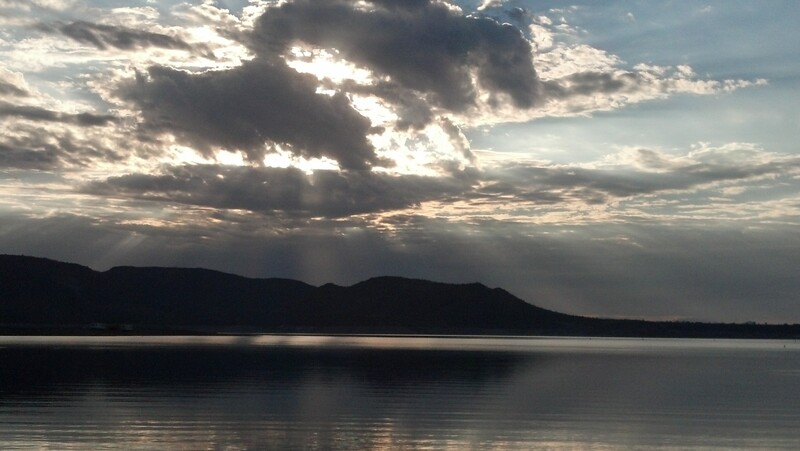 One of my favorite retreats from the city heat is Lake Pleasant, just north of Phoenix. 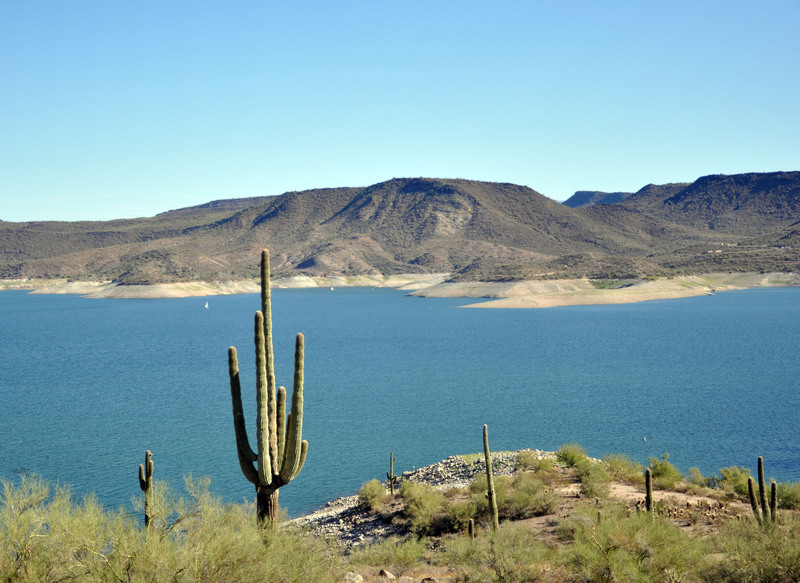 Lake Pleasant covers approximately 10,000 acres and boasts about 116 miles of shoreline (give or take). That may sound impressive, but I can guarantee you that most of the year that shoreline is pretty well covered – especially on weekends! There are coves to explore, trails to hike, and all sorts of wildlife to avoid. My favorite local inhabitants are the wild burros that roam the shoreline. Their braying is definitely an eerie noise to hear first thing in the morning if you aren’t expecting it! The lake offers superb options for boaters, anglers, kayakers, paddle-boarders, hikers, swimmers, divers, and pretty much anyone looking for a cool place to perch (smile). Lake Pleasant is a really popular spot with local scuba divers. It’s where I did my certification dives and several fun dives since. I’m always surprised at just how many dive flags you see in the coves, especially in the early mornings. A few of the local dive shops sponsor underwater clean-up days as well, which are both fun and useful. There are also several strategically placed “destinations” underwater, which keeps things interesting while you’re swimming about with the fishes (smile). Lake Pleasant is a unique and lovely landscape any time of the year. I love that it isn’t necessarily what one would think of when you hear the name, and the irony of the giant saguaros next to a large body of water never fails to amuse me. The fact that it’s only half an hour away from where I live is just extra sunshine on the water (smile). Lake Pleasant Regional Park offers a wide variety of rentals, equipment, and recreational options. If you ever have an extended stay in Phoenix, it’s a great area for an escape!! Lake Pleasant is a joke, lousy fishin lots of theft at marina, obnoxious shuttle drivers, water level changes frequently, no shade or trees, lot of drunks on water, and they will screw you at marina! Watch paperwork, and they don’t get back to you with a problem. What a lovely lake! The sunrise picture is magical. Thank you! Also, thanks for letting me know – I’ll be over to check it out soon! When our son moved to Phx 3 years ago, we brought furniture to him in JULY. Hot indeed. We love Lake Pleasant and spent six weeks there last Feb and Mar and will probably return in Sept (I know, still hot) but love visiting with our son 🙂 Great post!